Gravity Flow version 1.3.2 is now available via auto-update and for download from the account page. This is a feature release that includes a new field type, support for more Gravity Forms Add-Ons, support for post status management, new filters and some bug fixes. It’s already possible to use the Notes field to add comments to the timeline however, the timeline can get a bit crowded and sometimes it’s useful to manage conversations with the entry or add multiple conversations. The Discussion Field provides a way for users to maintain a conversation inside a form field itself which means it can be used in merge tags, conditional logic and exported along with the rest of the entry values. We’ve added support for the following Gravity Forms Add-Ons: ActiveCampaign, Agile CRM, AWeber, Batchbook, Campfire, Capsule, CleverReach, Freshbooks, GetResponse, Help Scout, HipChat, Highrise, iContact, Mad Mimi, Slack, Trello, and Zoho CRM. Full list of supported add-ons. If you have Post Fields on the form, you can now use the Approval step to change the status of the post – you can publish, mark as draft, trash or delete posts. – Added the gravityflow_inbox_submitter_name to allow the value displayed in the Submitter column to be overridden. ActiveCampaign, Agile CRM, AWeber, Batchbook, Campfire, Capsule, CleverReach, Freshbooks, GetResponse, Help Scout, HipChat, Highrise, iContact, Mad Mimi, Slack, Trello, and Zoho CRM. – Added post action settings to the Approval step if the form has post fields. – Added support for a delay offset to the date field option of the schedule step setting. – Added the following attributes to the shortcode: step_status, workflow_info and sidebar. – Added the gravityflow_revert_label_workflow_detail filter to allow the ‘Revert’ label to be modified on the Approval step. – Added the gravityflow_reject_label_workflow_detail filter to allow the ‘Reject’ label to be modified on the Approval step. – Added the gravityflow_approve_label_workflow_detail filter to allow the ‘Approve’ label to be modified on the Approval step. – Added the gravityflow_admin_actions_workflow_detail filter to allow the choices in the admin actions drop down on the entry detail page to be modified. 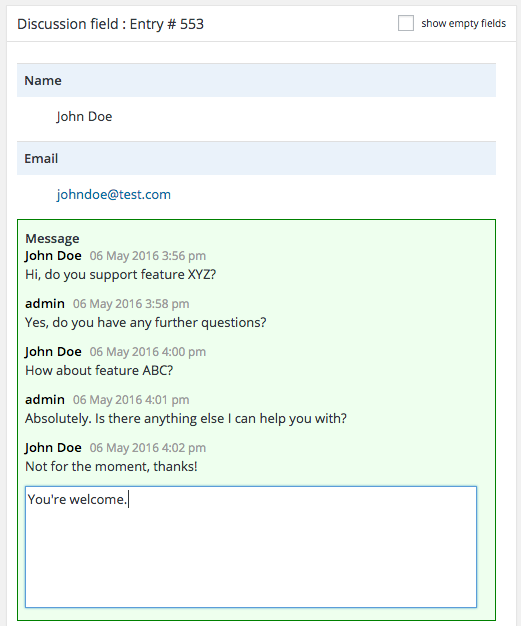 – Added the Discussion Field. – Updated to only add workflow notification events if a step has been configured for the form. – Updated choices for the notification events setting to be translatable. – Updated the list of steps in the ‘Send to Step’ section of the admin actions to display only active steps. – Updated the styles of the front-end entry detail page when the workflow info and step status are hidden. – Fixed an issue which caused all the Zapier feeds for a form to be processed on the Zapier step. Requires Zapier 1.8.3. – Fixed an issue with feed conditional logic evaluation for the Zapier step. – Fixed an issue with the license validation logging statement. – Fixed an issue with including the timelines with the printout from the entry detail page.